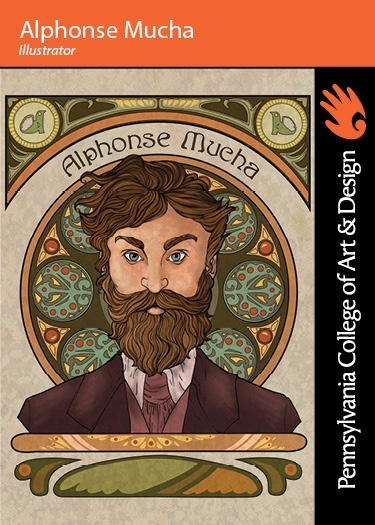 Alphonse Maria Mucha was born in the town of Ivancice, Moravia (today a region of the Czech Republic). His early career was spent painting theatrical scenery, first in Moravia, then in Vienna. Impressed with his freelance work painting murals to decorate his Hrusovany Emmahof Castle, Count Karl Khuen of Mikulov sponsored Mucha’s formal training at the Munich Academy of Fine Arts. Mucha moved to Paris in 1887, and continued his studies at Académie Julian and Académie Colarossi, at the same time producing illustrations for magazines and advertising. In 1894, Muncha produced a lithograph poster for the play Gismonda by Victorien, which starred Paris’s celebrated actress Sarah Bernhardt. The poster was so popular it launched its creator into prominence and its style into popularity. Although his style was often imitated, Mucha attempted to distance himself from it. He protested that, instead of working in a popular style, he was inspired by Czech art. He was frustrated by his fame earned through his commercial art and sought instead to concentrate on projects that would pay tribute to his Czech heritage. Returning to his homeland, Mucha became involved with the cause of Slavic nationalism, using the money he earned to fund nationalistic projects. He settled his family in Prague, where he decorated the Theater of Fine Arts, and contributed the murals in the Mayor's Office at the Municipal House and other landmarks of the city. When Czechoslovakia won its independence after World War I, Mucha designed the new postage stamps and currency for the new country. Following the war, he produced The Slav Epic, a masterpiece of 20 paintings illustrating the story of the Czech and the Slavic people. This was given to the city of Prague in 1928 and is now on display in Moravsky Krumlovat, in the South Moravian Region in the Czech Republic. Mucha’s work, and Slavic nationalism, was denounced as “reactionary” as fascism gained prominence in the late 1930s. In 1939, Muncha was among the first to be arrested by the Gestapo when German troops invaded Czechoslovakia. While imprisoned, he fell ill with pneumonia. Though eventually released, he never recovered. He died in Prague on July 14. Mucha’s style fell out of favor until the 1960s, when a revival inspired artists around the world. Although Mucha’s work is celebrated today, it was considered outdated at the time he created it. One of Mucha’s paintings, Quo Vadis, was the subject of a legal dispute in 1986. In addition to being an illustrator, Mucha was also a restorer of the Czech Freemasonry. One of the largest collections of Mucha’s works is in the hands of a former top tennis player, Ivan Lendl, who began collecting Mucha’s work in 1982. Interest in Mucha’s distinctive style experienced a strong revival during the 1960s, and continues to influence and inspire many artists today.